Just another routine upgrade on a customer’s computer; or so it seemed. I have upgraded many Mac computers. It is usually one of the most mundane tasks. I noticed the customer had a stalled Mavericks upgrade download that would not unpause. I rebooted, and was able to resume the download. When the install started, it asked for Admin password. There was no password, so I just clicked OK, which worked for all other installs. The password box continued to pop up, so I went to user and groups in preferences and created a temporary password; the Mavericks upgrade accepted the new password and continued, prompting for restart. It was all downhill from there. After rebooting, the install resumed and within a few seconds, got the “Install Failed”. 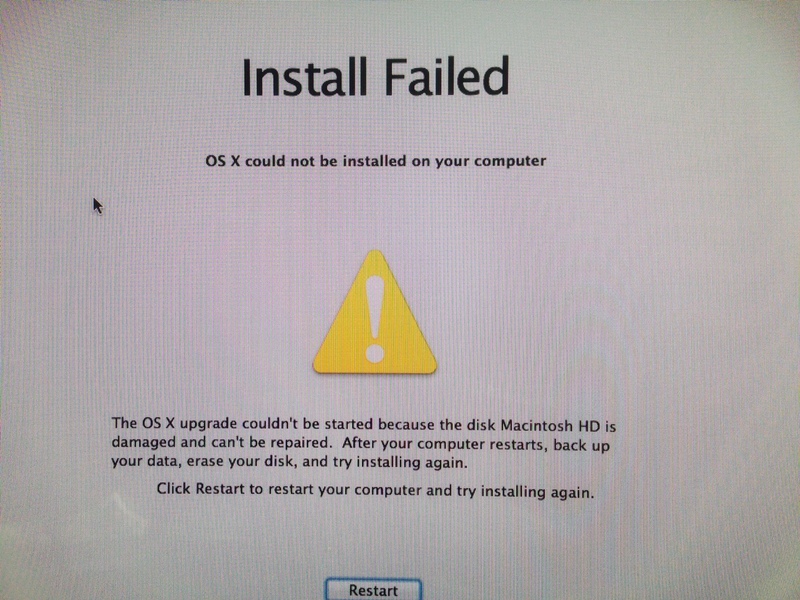 I followed the recommendation and ran disk utility from the current Mountain Lion recovery partition. Verification immediately reported errors and recommended repairing. Unfortunately repair didn’t work and stated it couldn’t be repaired. Boot in recovery mode and install Original OS to External Drive. Tell the install to transfer data from other drive which will copy from “bad” internal drive. Use disk utility to delete partition on internal drive. Used Super Duper to clone external drive to internal drive. I found it hard to believe that the drive suddenly had unrepairable errors given the computer was running flawlessly on Mountain Lion immediately before the restart. I was convinced Mavericks had hosed the file system. Searching the web, the advice was to replace the hard drive – that it was bad, blah blah blah. I didn’t accept that as true and was determined to get the data off the drive, and prove the disk was fine by erasing the partition and installing back on the same drive. My theory was correct. I connected an external hard drive to the iMac and used the recovery partition to download and install Mountain Lion to it. When the installation was successful and offered to transfer data, I chose “from disk”. And what do you know? I was able to migrate the data and settings from the Macintosh HD. Interesting, considering the disk was supposed to be bad and unrepairable. After successfully transferring all the customer data and successfully booting, I launched disk utility and erased the Macintosh HD. I downloaded the free Super Duper Mac cloning software on the external drive and cloned back to the internal. I can’t say enough about this piece of free software. It just works! Once this tasks was completed, I simply removed the external drive and booted normally. Just for confirmation, I verified the disk and it checked out OK.
Suspecting, that the first (interrupted and then resumed) download of Mavericks was corrupt, I deleted it and downloaded a fresh Mavericks package. After downloading Mavericks again, it updated perfectly. My conclusion: Don’t listen to people telling you need a new hard drive if your Mavericks (or future upgrades) fail and report hard drive problems. The chances of going from a perfectly running system to a hard drive crash after reboot is very slight. Follow the above steps and you will probably be up and running in no time.